We’re in Interlaken, Switzerland, about to embark on a day long excursion to Jungfraujoch, which at 11,300 feet altitude is called the “Top of Europe.” The weather prediction is for 90 percent chance of rain, although it’s bright and sunny early in the morning. Blue skies and fluffy white clouds seem to foretell a pleasant day, but we’ll soon know the difference altitude makes. 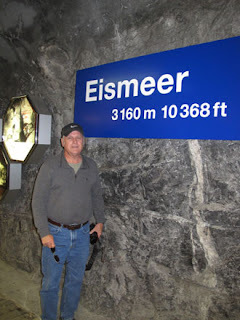 Larry and I walk five minutes from our hotel to the Interlaken Ost (East) train station and catch the train to Grindelwald. We change trains at Kleine Scheidegg to the cog railway that goes across Eiger Mountain; that part of the journey takes one and a half hours. Having been in Switzerland for several days already, we’ve become pretty good at navigating the widely-used train system. We travel through a valley with beautiful green, rolling hills. Scattered houses on hillsides dot the landscape like Monopoly houses on a game board. Cattle and sheep graze in the fields. But by the time we reach the Keline Scheidegg rail station at an elevation of 6,700 feet, snow covers the mountains. It’s a surreal scene in shades of black and white: Pristine undisturbed snow glistens in bright sunshine. One of the stops inside a mountain tunnel. 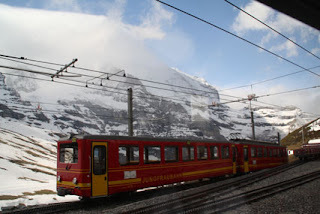 The cog railway travels at a steep incline along the side of Eiger Mountain, then heads across Eiger (with a view of the glacier), Monch, and Jungfrau Mountains. Although windows on the train will lower for taking photos, it’s quite chilly outside, so we wait for stops along the way. Two times during the 7.3 km tunnel passage the train pauses for about 10 minutes, so passengers can quickly get out and take pictures of the icy landscape through openings carved in the mountainous rock of the tunnel. After arriving at our destination, we miss getting a map of the place and wind up following a tour group until we find our bearings. We walk carefully on slippery paths in the Ice Palace and marvel at the carvings of bears, penguins, deer, and other figures displayed in icy vignettes. 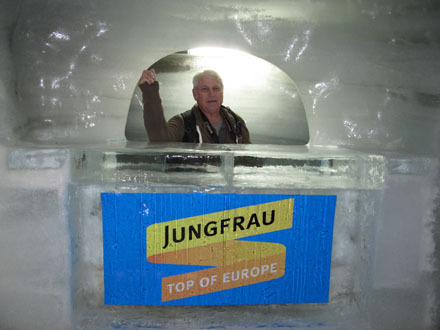 These ice sculptures are permanent displays, so the temperature is best tolerated with gloves and jackets. Visitor building with cables all around. Yes, it was very bleak and cold. After a snack we take the elevator to the Sphinx, where an outdoor terrace provides exceptional views of surroundings mountains. Except today (early May) it is snowing—so thick and heavy the only vision we have is of pure white all around. 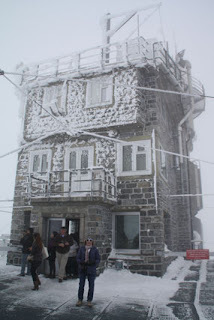 We’re disappointed that the weather has become so cold and windy, but that’s the chance visitors take when planning this mountainous trip. Even the section called Ice Fun was closed—no skiing, sledding, or even snowballs to duck on this day. Still, Jungfraujoch is such a unique experience through a snowy Alpine wonderland that I’d recommend it if you are in the region. After a few more photos, we board the train for the return trip. Traveling through dark tunnels makes my eyes heavy, but I snap out of it so as not to miss remaining views of the journey. We change trains twice and are relieved to get back to milder temperatures at Interlaken. A bowl of hot, cheesy lasagna is a welcome finish to the day’s adventure.